Top: Contains the Mini-toolbar, Design Button and Ribbon Menus, which are used to access design tools and options. Design Button: Provides access to commands for saving, printing and managing fence design projects. New: Starts a new design session. Open: Opens an existing design. Save As: Saves the current design with a different filename. 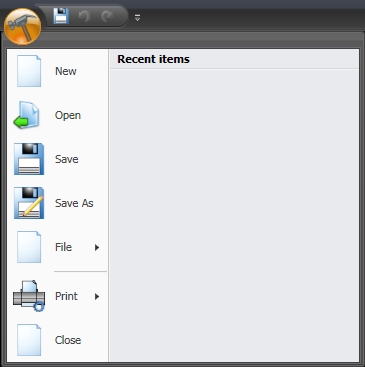 File: Displays the File menu, which provides options for file management. Print: Displays the Print menu, which provides options for printing and previewing your design. NOTE: Options available through the Design button vary depending on the software configuration. NOTE: Options available through the Ribbon Menus vary depending on the software configuration.